So what makes the Kilimanjaro Club so exceptional? And what special value does it represent for DVC Members? Let’s embark on a safari of sorts as we explore all that makes this one of the most incredible experiences offered at Walt Disney World. First up let me explain that I have a very strong affinity for this resort. It truly is my favorite, so simply setting foot here, much less spending the night or two, makes me very happy to say the least. 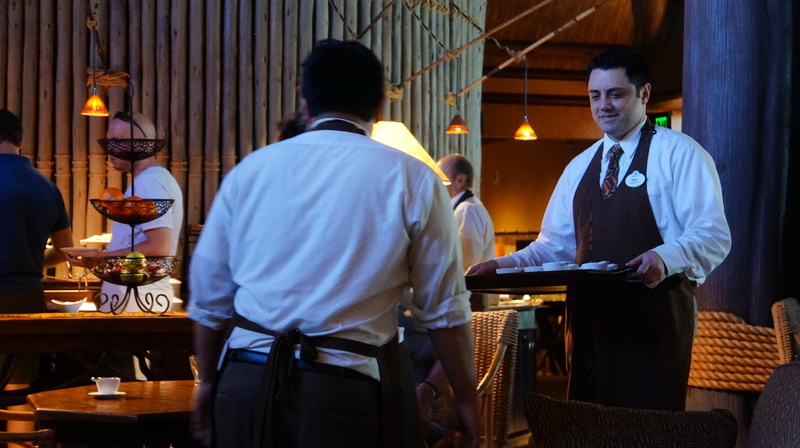 If you want to better understand what makes Disney’s Animal Kingdom Lodge the king of the Disney resort jungle, check out Six Reasons We Love Disney’s Animal Kingdom Lodge. 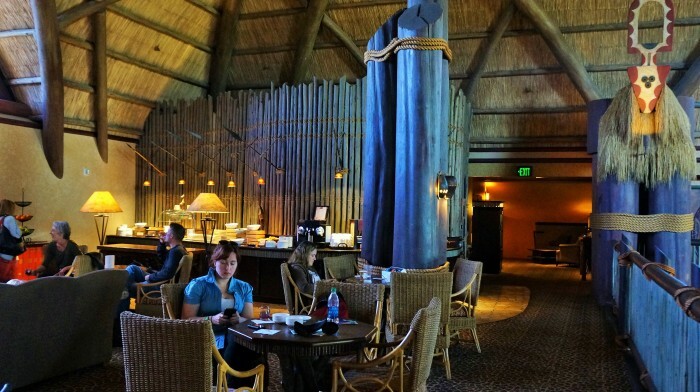 Now, let’s shed some light on why the Kilimanjaro Club level is so special for DVC Members. Disney Vacation Club is very different than the average vacation ownership. When DVC first arrived on the scene it was all but unheard of for a timeshare concept to utilize points rather than members having to stick to the same week and same unit type each year. The innovation hasn’t stopped there. In the beginning Disney Vacation Club existed as its own resorts within Walt Disney World and the Southeast (Vero Beach, FL and Hilton Head Island, SC). Soon DVC Villas were added to existing, well known Walt Disney World resorts. Flash forward about ten years into DVC’s existence. Disney Vacation Club leaders announced one of the biggest DVC Resorts to come on board, something never done before. Not only a new section containing DVC Villas and amenities, but DVC would take over a portion of the existing Animal Kingdom Lodge. This had never been done before and on its own was a pretty impressive feat. And then the cherry on top; the Kilimanjaro Club would become an experience DVC Members could not only use their Vacation Points for, but the entire 6th floor Kilimanjaro Club hotel rooms would be converted to Disney Vacation Club villas! In the world of vacation ownership it is extremely rare for owners to have the opportunity to use their membership to stay in the regular hotel portion of a resort. And the additional indulgence of using your vacation ownership to stay at a concierge level? No way, that’s not what vacation ownership was created for. But alas Disney did it and it is one of my favorite ways to use my membership. One of the luxuries of practically any concierge club level at any hotel is the arrival and check in experience. Upon arrival I walked over, or perhaps it was floated dreamily enraptured and enthralled, to the large impressive front desk. After a few moments of viewing my reservation the front desk Cast Member called over another gentleman with an ear piece and a touch screen tablet. 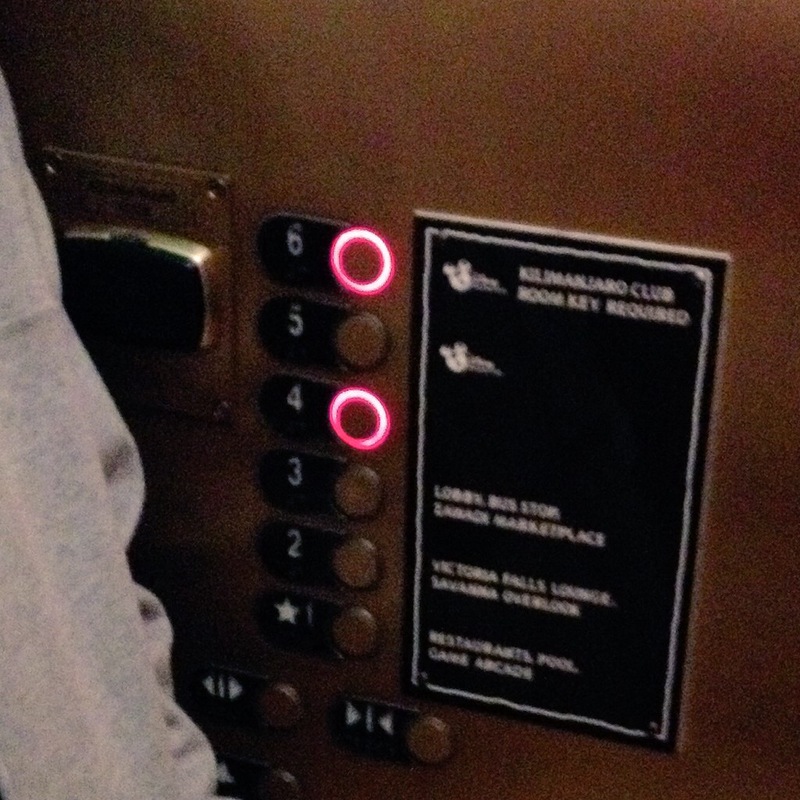 Greeted with a warm Disney smile, we walked over to the elevator bank and the Cast Member used a card to tap the RFID reader so that we could access the top floor. The Kilimanjaro Club itself is perched on a landing on the top floor, overlooking the grand, open lobby. The sounds of the energetic lobby rise in the air. Two desks sit at the entrance of the club with two concierge Cast Members. Upon my arrival on this particular trip, both desks were occupied so I was escorted to one of the dining tables and asked if I would like a glass of sangria to welcome me (who could say no to that?). As I settled in I felt a wave of warmth and contentment wash over me. This is my bliss. Once a Cast Member became available I was seated at one of the desks. I was asked if I had stayed before and upon explaining that this was my favorite resort and that I have stayed many times before, the check in process became very rushed and simplified. Usually this is not the case, and I was a little surprised at the change in demeanor that took place. 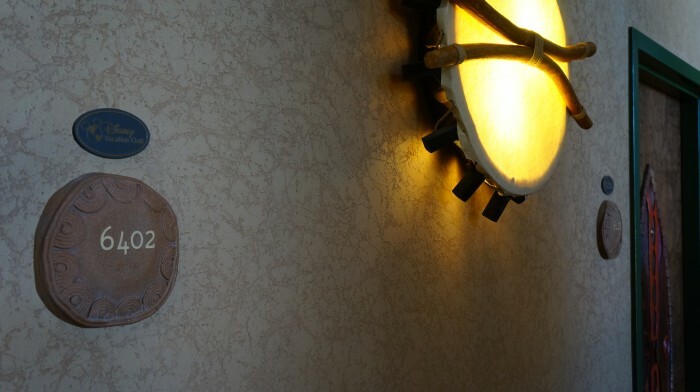 Unfortunately in the new found haste, the Cast Member forgot to have me set a pin for room charges using the MagicBand (which became frustrating when we were in the parks, but we got it corrected that night). Still, it was nice to be seated in an exclusive area as the adventure began. For Disney Vacation Club Members using their vacation points to stay at the Kilimanjaro Club, one downside is the inability to select your room’s view type. 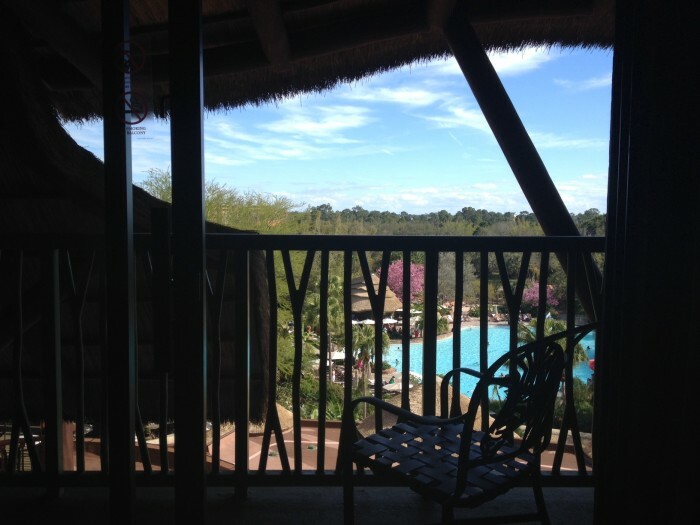 Your view will either be of the Uzima Springs Pool or the Sunset Savanna. After three club level stays using our points we’ve had a savanna view once and the same exact room facing the pool twice. We’ve also learned to not care too much about the view. Anytime I’ve had a savanna view I’ve found myself wanting to be on the balcony 24/7 afraid I would miss something neat. Having a pool view enables me to relax and not feel guilty for being out and about enjoying the rest of the resort. 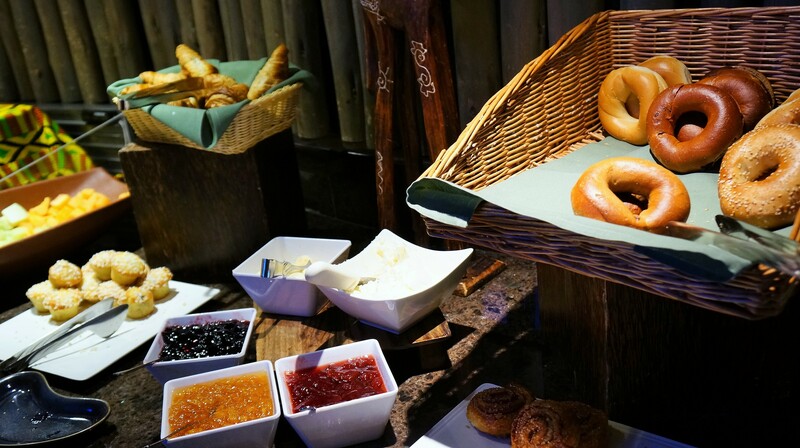 Breakfast / Miamko (Adventurous Awakenings) [7:00 AM – 10:30 AM]: The most important meal of the day is pretty scrumptious at Kilimanjaro Club. Like most club level breakfasts, there is no hearty protein offered. I would call this is deluxe continental breakfast. A bounty of bagels, muffins, and croissants is accompanied by fresh preserves and butter. A luscious selection of fresh fruit includes melons, pineapple, and a variety of berries. 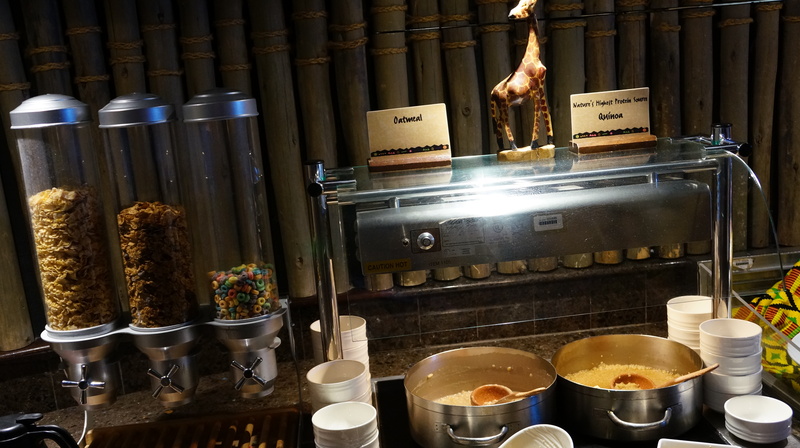 There’s also cereal, oatmeal, and quinoa (fun fact: Boma was the first place I ever had quinoa over five years ago). Personally, I am a greek yogurt person which thankfully can be found in the beverage cooler. Don’t forget to try a glass of Jungle Juice! 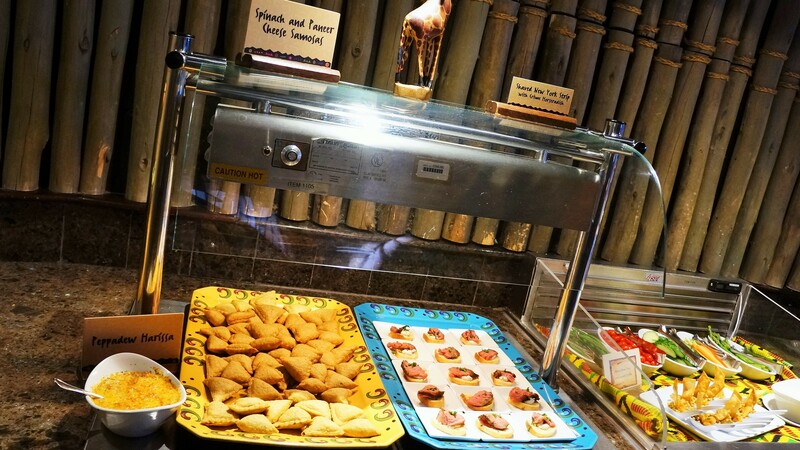 Snacks and beverages / Vitafunio (Safari Snacks) [11:30 AM – 3:30 PM]: Most guests head out to the parks or off on other adventures during the day, so there isn’t much need for extravagant food or beverage during this time. 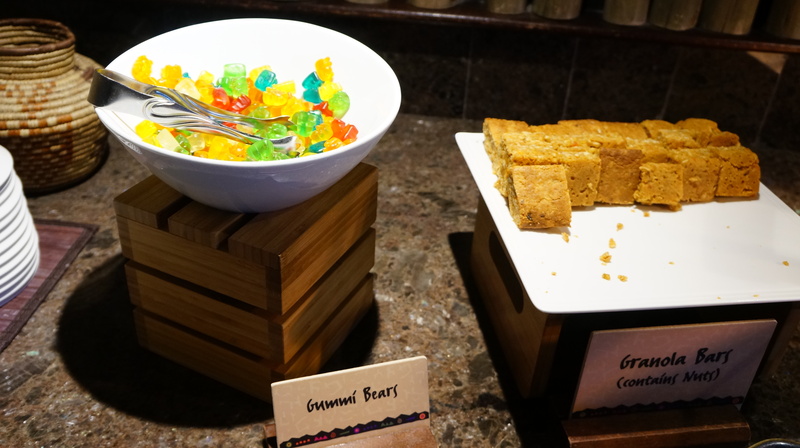 However, if you find yourself in need of a little nibble you can choose from gummy bears, spiced mix nuts, a special snack mix, and house made BBQ seasoned potato chips. Soft drinks are stocked in the beverage cooler as well as tea, Jungle Juice, and lemonade in beverage dispensers. 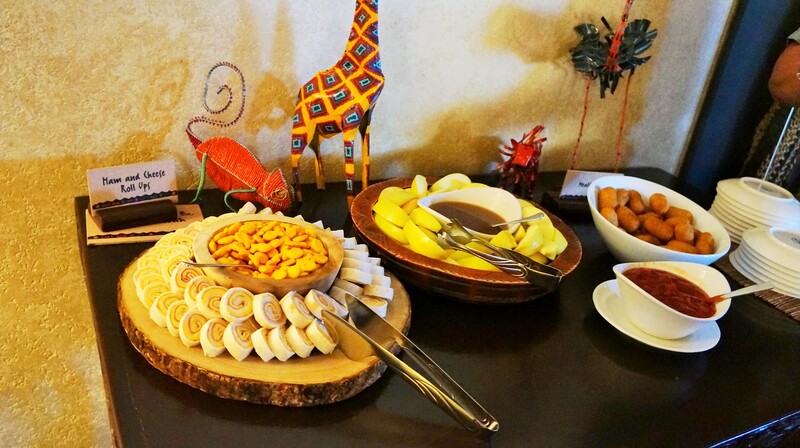 Chai (Afternoon Tea) [3:00 PM – 4:30 PM]: This is one of my favorite features of Kilimanjaro Club. 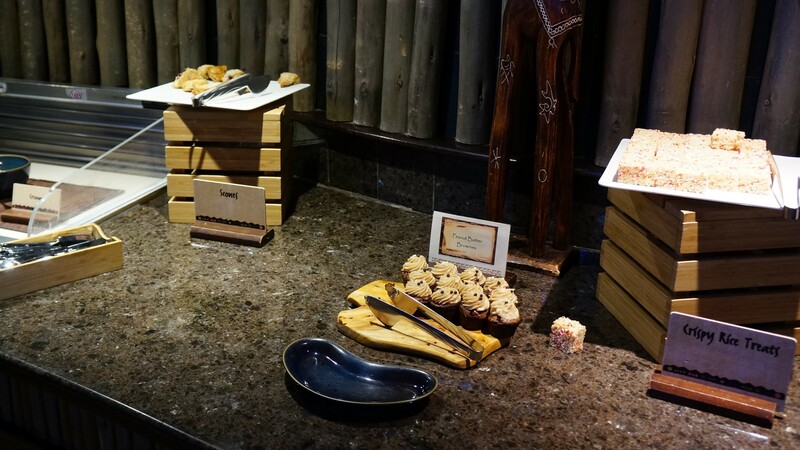 Afternoon tea is a tradition at safari lodges in Africa and it is wonderful to see Animal Kingdom Lodge carry that tradition. A variety of specialty teas are presented; guests select the tea bag of their choosing and make their own cup. A small sampling of pastries are offered as well as scones. At the sight of scones and cream my United Kingdom heritage suddenly comes out to play. I don’t care if it’s a chilly or hot day, I will head back to the Lodge to indulge in tea, scones, and cream! Hors d’oeuvres and beverages / Kisikusiku (Twilight Offerings) [5:00 PM – 7:00 PM]: Naturally this is the most popular service of them all. Like animals migrating to the watering hole, nearly all guests with club level access migrate here for this service. Personally my favorite part is the South African wine. It is pure bliss to be able to sample as much as I like, indulging in wine from one of my favorite regions in the world. During our recent two night stay we had the unique opportunity of experiencing the traditional evening service on our first night and then trying a new feature during the evening service. 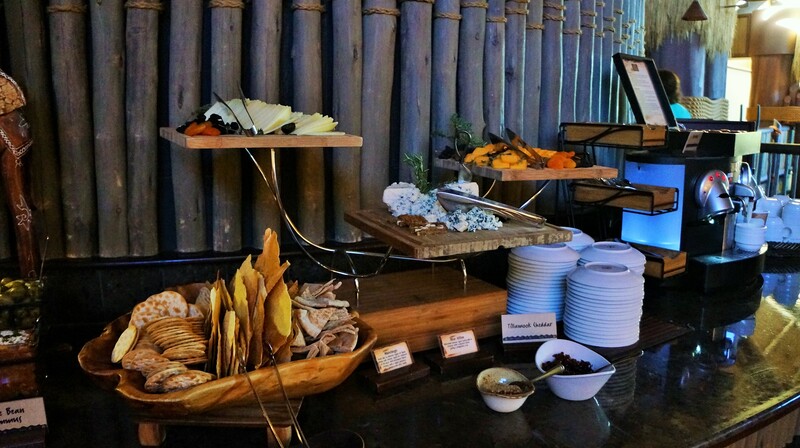 We were the very first guests to experience this new test at the Kilimanjaro Club. 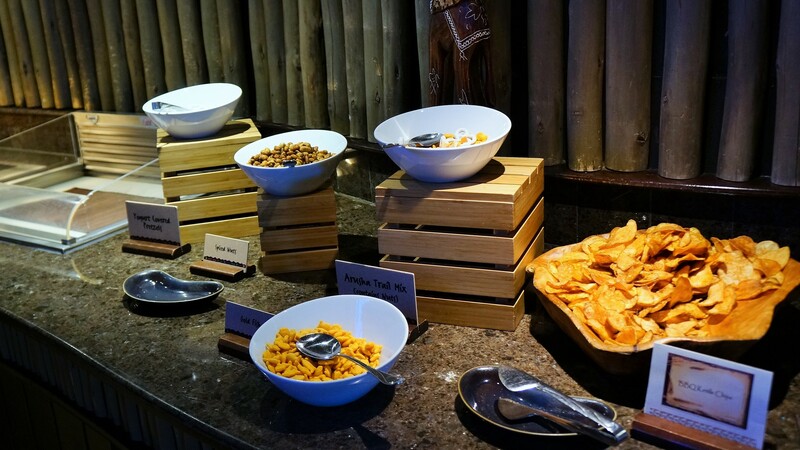 Traditionally the evening spread consists of a variety of cheeses, fresh vegetables, a variety of bread, dips and hummus, and two warm hors d’oeuvres presented by the culinary teams at Boma and Jiko. 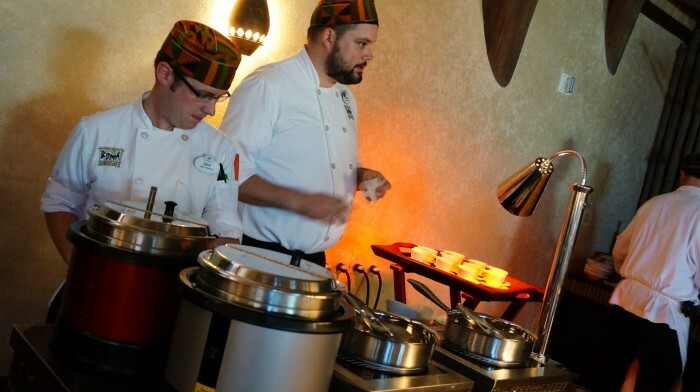 The test involved removing the two warm hors d’oeuvres and replacing them with two freshly prepared bites finished off by the culinary team right there at the club. 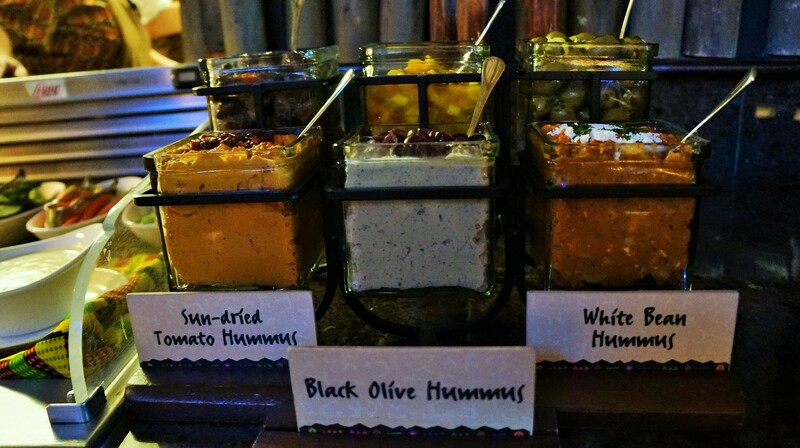 These scrumptious samples were then delivered to each guest as they sat and relaxed in the club. During our night, the first night of this test, we were presented with an African beef medallion and Ivory Coast seafood stew. The Ivory Coast seafood stew was addicting! A creamy, ever so slightly spicy broth with bay scallops and petite shrimp is delightful enough, but then coconut basmati rice is placed on top like a crown; it was absolutely delicious! 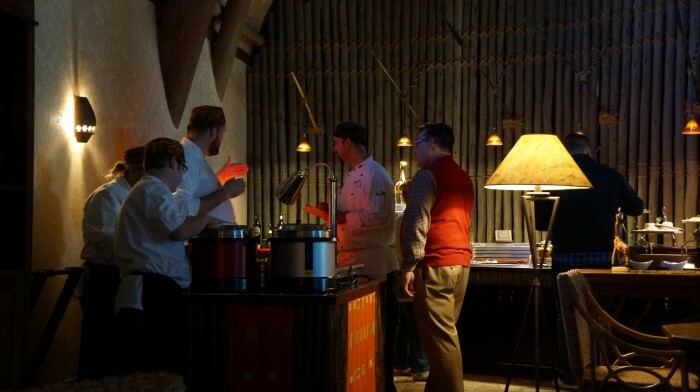 Although we enjoyed the seafood stew and interacting with the culinary cast members, the new method caused guests to linger in the lounge much longer than the traditional method since the hot hors d’oeuvres must be brought to you and many guests would wait around to received seconds or thirds. It was a very nice touch, however, I am not sure if it is the most practical. It isn’t clear how long this test will run for and whether or not it will lead to a permanent change. Desserts and cordials / Rehema (Evening Indulgences) [8:00 PM – 10:00 PM]: After indulging in the sumptuous spread and beverages offered during Kisikusiku it’s difficult to imagine that more delights await. End your evening with the stuff that sweet dreams are made of: desserts and cordials. Usually about 2-3 different mini desserts are offered, many of which are simply sinful. 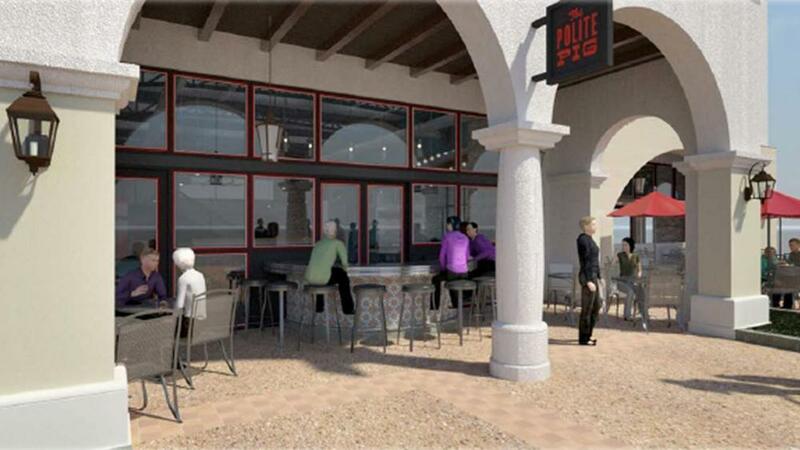 Coffee, tea, and soft drinks continue to be offered. To wrap up your day with something more magical fill your glass with ice and pour yourself a nightcap. Usually there are four cordials offered: Kahlúa, Grand Marnier, Couvosier, and (my personal favorite) Amarula – a cream liqur from Africa. I like to experiment a little and my favorite combo is 2 parts Amarula and 1 part Grand Marnier, a dreamy mix that has lingering notes of a Creamsicle. The magic of a club level stay actually begins before you arrive. A few weeks before your check-in you will receive an email from your resort’s concierge team offering their assistance with planning your vacation. Of course with the implementation of MyDisneyExperience guests can plan every single detail of their trip, but I encourage you to use the assistance of this team – after all, you’re paying for it regardless. Besides the wonderful food & beverage services throughout the day, there are additional club level perks. For DVC Members this is the one time in which your vacation points include not only daily housekeeping, but also turn down service. It is a nice indulgence to experience both services (don’t forget to budget $2 – $3 per adult in your room to leave some cash for your attendant each day as a courtesy). Finally, DVC Members already enjoy complimentary DVD rental at all Disney Vacation Club Resorts. In addition to this perk, Club Level guests (DVC Members or otherwise) can rent DVDs for free from the club level itself. It’s nice having that extra variety. Staying club level at any hotel can certainly be pricey. If you plan on being in the parks non-stop and not spend a whole lot of time at the resort, it may not be worth booking club level. 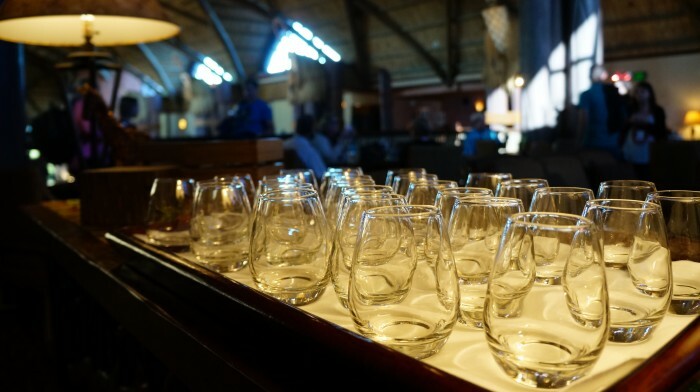 However, if you make the most of the extra services and plan on spending some time soaking up the glorious atmosphere at the resort, then I think the Kilimanjaro Club affords nice value and an incomparable immersion into the exquisite cultural experiences offered at the breathtaking Disney’s Animal Kingdom Lodge. Thank you and asante sana to all the wonderful Cast Members at Disney’s Animal Kingdom Lodge who made our stay another magical memory! This was interesting. I didn’t know we could rent DVD’s from club level. We stay club level every summer for the past 4 years or so. This is our favorite resort to stay at as well. 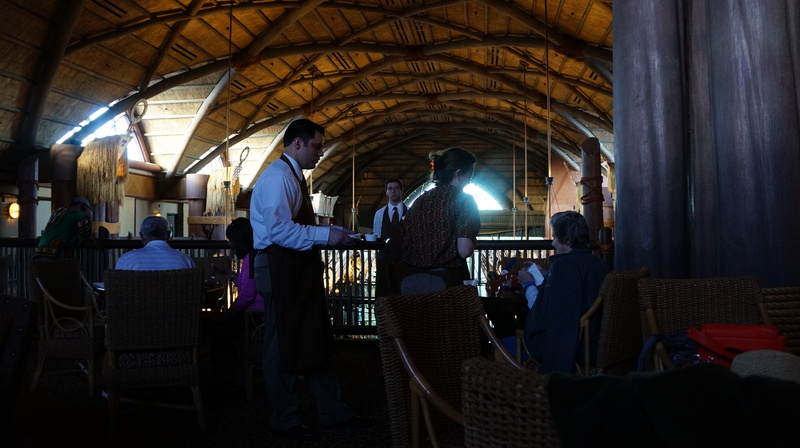 I do think however, that they should move to no DVC in Jambo house and put another club level in Kidani. Thank you for the great article. 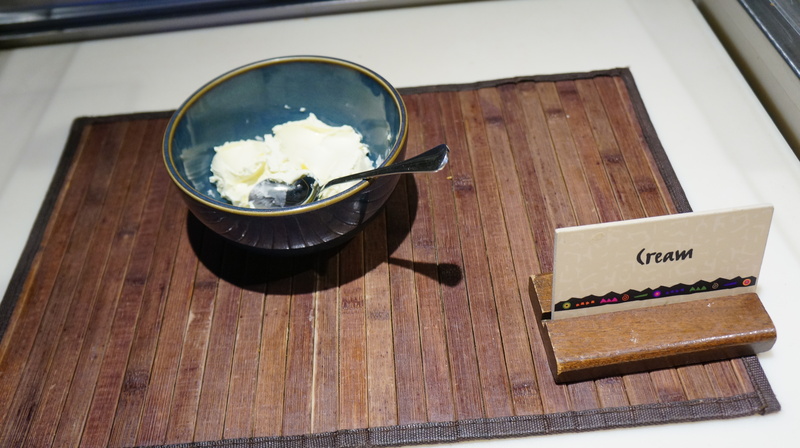 We’ve stayed club level at AKL three times, and in addition to all of the wonderful things mentioned here, we enjoyed the nightly turndown service. This included gourmet chocolates (no mere Andes mints here) and cards printed with African proverbs. One thing we do miss in the new era of MagicBands is the gold KTTW cards you got for staying club level, though. While not (currently DVC member — will be soon), have stayed Club Level at a few resorts: AKL; GF; and Contemporary. Your point about checking in with the concierge desk staff is hauntingly familiar. Really seeing some of the staff politeness and completeness of their job falling by the waste side — especially at Contemporary. Have emailed Guest Relations a few times and it is something from a coaching perspective they are committed to working on. Is it only DVC club level where you can’t specify savannah view? 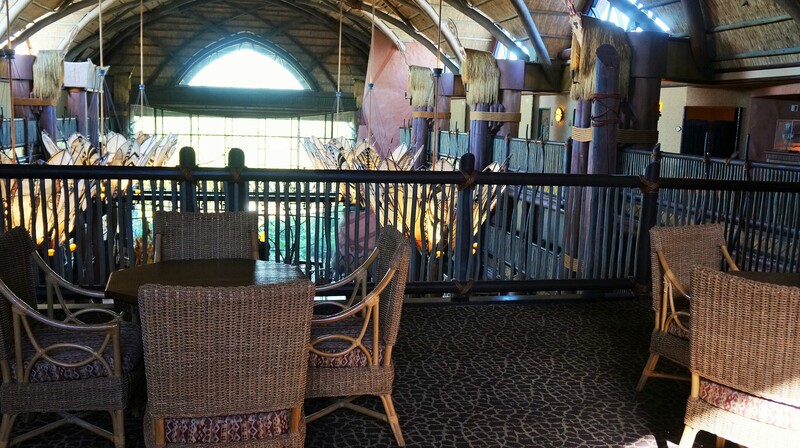 For me the whole point of staying at AK lodge is the savannah view so no amount of food/lounge/turn down service would be worth fforgoing the view. The only rooms that are on the Kilimanjaro Club are DVC Studios and One Bedrooms. With these room types the view cannot be specified. If regular hotel rooms are offered with access to the club level (rooms would be on a different floor than the lounge) then those views can be secured at the time of booking, depending on availability.